The Center for Digital Inclusion is proud to support local initiatives around ICTs, inclusion, and community engagement. CDI also supports engagement with local communities through support, volunteerism, and active participation. This website is a partnership between the United Way of Champaign County, the University of Illinois Office of Public Engagement, Office for Math, Science, and Technology Education, and Office of Volunteer Programs, and a few members of the general public interested in making volunteering easier in our local community. CDI supported the production and installation of the new interactive mural in the Rose and Taylor Barber and Beauty Salon on North First Street in Champaign. 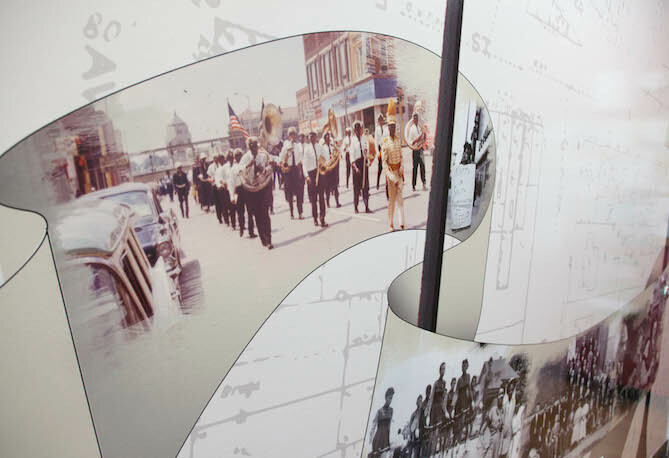 Photos featured in the mural reflect African-American history in Champaign with photos dating back to 1920. A free smartphone application also allows viewers to hover over images on the mural and see captions and descriptions. The mural was created for the North First Street Association by students at the University of Illinois and supervised by Professor Kevin Hamilton. Production and installation of the mural was made possible by the Center for Digital Inclusion in the iSchool at Illinois, the Public Art League and Martin Graphics.